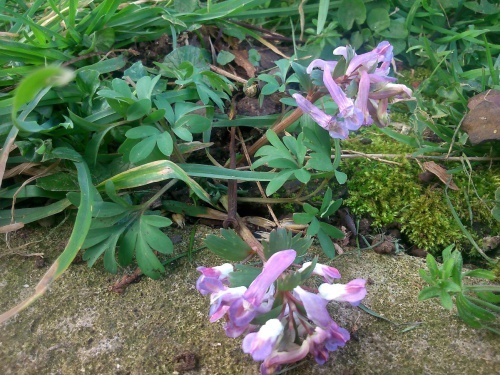 Growing to about 25 cm in height, with grey-green, divided leaves and narrow, dense, terminal racemes of pale pink, purple or white flowers 2 cm in length. Found in woodland, hedgerows, churchyards and rough grassland, and on roadsides, river banks and walls. It occurs as a garden escape or throw-out, and often becomes naturalised. In flower during April and May. Tuberous perennial herb. Reproduction is by seed and tubers. Widespread but occasional in Britain as an escape from cultivation. Uncommon in the wild in Leicestershire and Rutland. In the 1979 Flora survey of Leicestershire it was found in 3 of the 617 tetrads.